James Taylor and Nick Compton produced a very disciplined, hard-fought partnership on day one of the first Test in Durban. It was exactly what England needed at the time after they had lost three quick wickets to leave them 49-3, and helped them reach 179-4 at the close. Captain Alastair Cook suffered his first duck in 40 innings and I was surprised by Joe Root, who looked well set and confident but was dismissed by the spinners' first delivery of the day, which did turn - perhaps a sign that spin will play a part in proceedings once the sun comes out and dries the pitch. 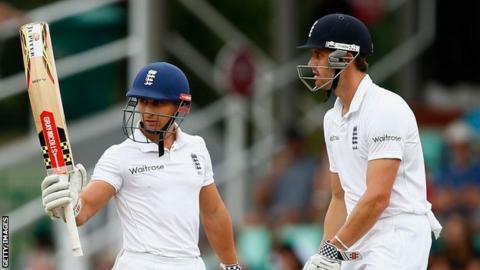 But to have players other than Root and Cook coming in and playing well when England were facing a problem is a good thing for the side. It shows they have others who can step into the breach. I think everyone recognises that Taylor is a really promising young player. At 25, he is now completely different at the crease than when he first played Test cricket in 2012. He is much more confident. Even Test Match Special summariser Graeme Smith was paying tribute to him today for the change he has seen in him at the crease. He played really well, and it was sad that he got out in the dying moments of the day as Dale Steyn picked up his third wicket of the innings. Compton is the one who had a lot to prove after being dropped following the home series against New Zealand in May 2013. Having received quite a lot of sympathy for losing his place after scoring two centuries away to the same opponents two months earlier, he has come back and started to prove a point. The technique he showed today is exactly what you want from a number three when the team is in trouble. The ball did a bit, although not much, but the team was in trouble and it was a very good examination of him. The pressure was not on him to score particularly quickly, therefore he could get in and bat, and that is what he likes to do. He gave a very discreet clenched fist pump when he got to 50. He is an intense individual but he is also a good player. Opener Alex Hales will obviously be a bit of a talking point. His dismissal was of the type his detractors point to as an illustration of how his technique will let him down in Test cricket. The ball from Steyn wasn't a half-volley - it was wide and he chased it. Unfortunately, in Test cricket, you can't take that amount of risk early in your innings. The 26-year-old has a great eye, he has scored explosive hundreds in one-day cricket and there is an argument for saying let him play his natural game. That's OK, except when you are in circumstances like this on the first morning of a series and you have two of the best bowlers in the world running in with the ball doing a bit. Do you really want to be throwing your bat at a wide length ball? The odds are already stacked in the bowler's favour. You want to even up the odds, and that means leaving well and playing solidly with tight footwork. Some people will judge him on today's dismissal but England have got to give him a chance and persevere with him. He is a talented batsman - it will be a steep learning curve and he will realise he needs to tighten up a bit. Hopefully he will find some flatter pitches than this as the series goes on. Jonathan Agnew was speaking to BBC Sport's Phil Dawkes.